The Hoodsport Trail Park is used as a destination trail park by avid hikers, nature lovers, birdwatchers, picnickers, for youth education and most recently disc golfers. This forest has grown up after being clear-cut in the early 1900s. In 2011 and 2012 the forest was significantly thinned due to root rot infecting the Douglas Fir trees. Under a reforestation plan, the forest was replanted with 17,000 native trees, bushes and plants, it is now transforming into a more complex ecosystem conducive to a healthy forest. The one half mile Lower Loop trail is close to Dow Creek which is very shaded and an easy trail providing a comfortable stroll for a familes. The Upper Loop trail is warmer than and not as shady as the Lower Loop due to a nearby DNR clear-cut and the recent thinning. This mile of trail features some uphill walking and switchbacks. The Upper Loop also includes a section that proceeds up and around a very large, beautiful big leaf maple tree. Maps of the hiking trails can be obtained at the Kiosk in the parking area. There is an outhouse, trash can and picnic table in the parking area. Please be mindful of your trash. Please do not dump household trash. The Hoodsport Community Trail Park offers a refreshing journey through a forest ecosystem going through change, growth and rebirth. • Large stumps, first harvested in the early 1900s, now serving as nurse logs to the next generation. • Older trees that were too young to be cut in the early 1900s that are now over 100 years old. • Dow Creek winding its way through the park. Leave the parking area and head away from Highway 119. Cross over Dow Creek on one of two bridges. This accesses a number of loop trail. The longest loop is approximately one mile round trip. 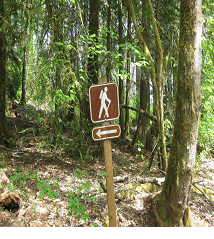 These trails climb some and are accessible for hikers of all ages. There is no wheel chair access at this time.